Learning how to speak cat is not simply a parlor trick you can perform to amuse your dinner guests. It’s an important part of training your cat and reinforcing your bond with her. Teaching your cat simple commands like “DOWN” and “NO!” will make her a better pet, while words like “Treats!” and “Dinner!” will help her associate you with something pleasurable. Wondering how to speak cat? Follow these tips and tricks. Photography ©SensorSpot | iStock / Getty Images Plus. Some cats (like the Oriental breeds) are vocal and have extensive vocabularies. Other cats scarcely “speak” at all, or have a one-size-fits-all yowl that covers all the bases. 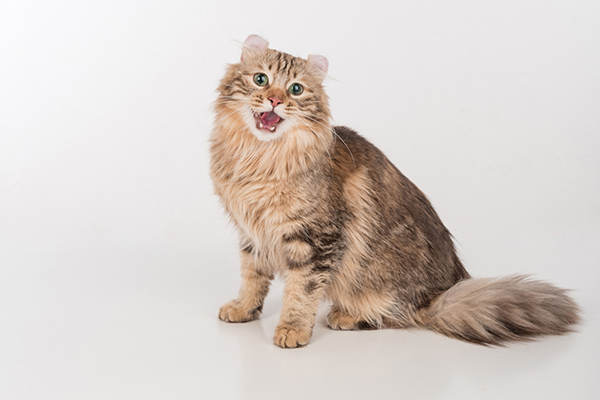 Whether your cat is vocal or not, she will be fluent in body language, a key component of her interactions with you and other animals. By tuning in to both her body and her voice, you can learn how to speak cat. Clicking or chirping sounds: Cats who are tracking prey will make a distinctive clicking sound. Licking: The ultimate sign of affection. Or an indication that you need to clean up after a sardine snack. When learning how to speak cat, the words you use are less important than how you say them and the body language that accompanies them. If you say “DOWN!” or “NO!” in the same tone you use for, “Good kitty! Here’s a treat,” you’ll confuse your cat and she’ll misinterpret what you’re saying. Consistency is the key to successful communication with your cat. To correct behavior, use a loud, firm, authoritative voice, and use this same tone consistently in conjunction with body language. For example, when ordering your cat “down,” make a stern face, and use one of your hands to point down. For praise, or when calling your cat to dinner or offering treats, use a higher-pitched “happy” voice, smile, and beckon with your hand. If your cat is begging for attention when you are trying to work or accomplish some other task, you will need to say “NO!” firmly, and gently push the cat away without showing affection. Cats don’t have much respect for the human’s personal space and will try repeatedly to invade it, so you may need to repeat this several times before Fluffy gives up and leaves you alone. If you say “no” and pet your cat instead of pushing her away, she will interpret your actions as a welcome signal. 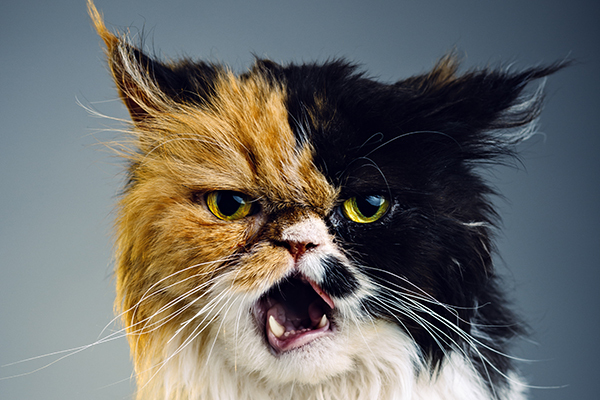 Most cats will also respond to a sharp hissing or spitting sound as a “no” command when they are doing something seriously wrong and need to be stopped. If you consistently use the same voice, facial expressions and hand gestures, most cats will have no trouble understanding what you say. The more you communicate with your cat, the better the two of you will become at understanding each other. Tell us: How do you speak cat? How does your cat talk to you? I signed up for Catster and I’m getting the mags. (Wish they were dated). Your system won’t let me vote for a cover picture. Why? Love this. So my chatty one is happy to see me and the licker is showing affection despite my best attempts to get away from her. And the old man in my face every night is trying to figure out f he’s in the right bed. It’s that last part I take issue with. We’ve had up to seven cats at a time in our household for for going on four decades. We were/are very close to them and they to us, and know each one very well because of how much time we spend with them. I have YET to find a cat that purrs when in pain or afraid. It just doesn’t happen, in my experience. I’d to see some solid evidence for this. Based on my husband’s and my experience with multiple cats, I simply don’t believe it. I’ve seen it several times. Had a cat that was dying and fell into his foodbowl and just lay there purring. I do not believe he was happy but was self-soothing. Had another cat who used to purr when getting his temperature taken at the vet, and I know he was not a fan. I learned absolutely nothing from this. I could kiss you for that! I read in a book one time that infusing English words with meows with the right pitch can also be helpful. For example, I would say”Meorocky”, (which is my pet cat Rocky’s name in cat.) when ever I needed him to come out. It works. In current psychology, the sub-field known as Interpersonal Neurobiology (IPNB) investigates the biology of how humans perceive nasty/nice and react accordingly. Stephen Porges, PhD, a trailblazing neuroscientist in this field, coined the term “neuroception” to refer to this below-conscious-level perception. I am fortunate in that most animals I meet seem to neurocept me as safe. My cat Tobias (can I attach a picture?) came running up to me after I had played with every other cat in the rescue while he was in another room. They were all friendly, but he ran up, jumped onto my lap, head-butted me, and settled happily in–which is why he was the one who came home with me! I also try to make eye contact a lot and give them a warning before I come up to them, like making sure we meet eyes or saying “hey” before petting them. They seem to appreciate it, and I know I hate when people come up to me & touch me without any warning. I also like to match their meows, like that short chirp-meow they make when you wake up or get home, or the insistent food request meows, I’ll say “Meow, hi, I’m happy to see you too.” or “Meow, I know honey let me grab you some food.” It’s fun to see how long you can keep a cat conversing with you back-and-forth with meows. thank you, a stray keeps coming and each time i give him food he meows about 3-6 times when i come over to him! :) Now I know what it means! Our cat Luna has a mix of Siamese in her and she loves to talk; she seems to understand English. She has a very distinct “Mawm” (Mom) cry when she wants me or my attention. She calls this when I get out of her site even! She will carry on a conversation with you too, it’s quite amusing! For a treat I taught her to use her manners so she will sit and look up and around and then let out a Meow! This is the only time she will do this. Very unique!!! A one of a kind cat!! Many have told us this. Cool, Cats are awesome pets!! I have a unique cat myself…about a month ago I was at my desk and crumpled a piece of paper and tossed it at the garbage and I missed, so my cat runs and grabs it and brings it back to me, I couldnt believe it so I threw it at the wall on the other side of the room and she brought it back again and again lol so now I have a cat that loves to play fetch like a dog, we play everyday! MyBengals also love to play fetch. Stanwyck’ s favorite is the pull tab off the quart of milk. Brings it to me every morning to play. Had a little black one that liked to play soccer goalie with a little ball. He always stopped that think and gave it back to me. Yours is the first retriever I ever heard of. You get 1 or 2 special cats per lifetime. I have one that I swear says “Mom”, too. And another that says, “No” when I ask it a question. this is kinda hard to exactly understand. maybe add some more things in? Another way my cat communicates with me besides all of his different sounds and meow’s is by locking his eyes with mine and stare very intensely at me. I have learned that if I stare back and maintain this eye connection for several seconds while speaking affectionately to him, he will come straight to me, even if he’s across the room. He then meows and trills at me! Sometimes I can’t figure out what he wants but it is so so cute. 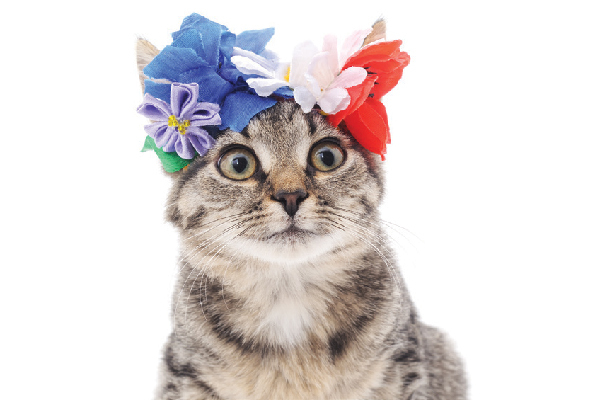 I love receiving your Catster tips and topics each week! I have a male Korat who is wired this way. He’ll stare at me, I back, and he comes or does the slow blink before coming to get cuddles. Korats are so special and many people do not know much about them. They extremely bond to there human. I like how my cat has retained all of his kittenish ways. In my experience, a stare is a way of begging for something. He’s probably asking for dinner, a treat, or to be let out? But this article will surely help me understand my cat better. Hi Diana Boy I was so happy to read that you have a 26 year old male cat. My Lucy is a female seal point Siamese who is 20 it would be great to have her for another 6 years. Now I know all cats are different but one can hope. I didn’t see Lulu’s particular loud sound above but I think she” trills” and quite loudly, almost sounding as though she is in pain. Usually I find she has had a play with her favourite toy!! All in all she is a talkative girl. My Russian girl, Annabel has quite a vocabulary that sounds almost like a dog bark at times – its all for attention when she is demanding something and I get an intense stare from her at these times. Wonderful creatures that I wouldn’t be without. My explanation of cat in season being “oestrous” is for Ebbie’s query in February 12, 2018. I only know it as “oestrous”, which word is related to oestrogen. I hope you got an answer before I saw your query. However this is the correct term. I think I speak cat pretty well. But there is one thing I do not understand. My cat quite opbviously chose ME over other people. He made this obvious to me and the woman who had been feeding him outside for a year. He came running right up to me, tail up, ears forward and very friendly. The wopman was shocked, as she said he was scared of everyone but her! Well, he sure wasnt scared of me. How do cats KNOW a human being is safe and friendly to them??? Is it smell? Visual? I would love to hear from others on this. 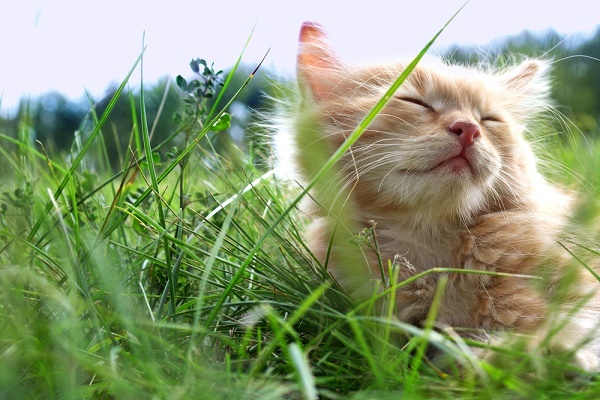 It is most likely someone’s smell and the cat’s amazing senses. Cats have very sensitive senses, so they can just sense who/what is friendly. If we can sometimes sense nice and suspicious people, I’m sure cats can do this and many times better than we can. Cats just know which people are cat lovers, too. If you haven’t invested in a “Top-Loader” carrier. you should. It is so much easier and less stressful to gently put the cat into the carrier via the top door versus trying to stuff the cat into the carrier through the side entrance. This will make it much easier to get your cat to the vet and back. Judging from the first few paragraphs, it seems this is only about female cats. Try writing something without a “her” or “him”. How about “the cat” or your cat”. Your not the only one that does this. I am a Catster fan, and as a Biologist, a fan of just about everything that creeps and crawls. I own (was given) a trio of Manx (1 had a complete tail, the others only a stump, or none). The largest Manx was named Shortcut. The boys were born 2012. I do snake surveys for the CSC..and would you believe, my Manx Shortcut has caught (absolutely with no harm to them) 3 or juvenile Northern Brown snakes. How he gets them in his mouth, how he knows who to bring them to is amazing. He also is a true Manx, taking up to 6 meter leaps, from an upstairs window to the ground below. I’ve always have had or am saving cats, & I do have success in preventing certain ‘hunting’ instincts. They have brought in young birds, none ever hurt…but a cat that helps you catch snakes? That’s gotta be some kind of record! Louise, all cats have their likes and dislikes, and some cats just do not like to be picked up. It doesn’t mean they aren’t fond of you, maybe they just don’t like something about being held so far off the ground with no control!! Why do some cats refused to be picked up but love to be petted and will get into bed and lie there with you? My cat was adopted from a shelter and I am wondering if she was a ferrel or otherwise abused she was found out on the street by a kind shelter person.I am dying to pck her up and cuddle her. same goes for trying to get her ready for a vet visit. will fight not to get in her carrier. I usually meow at my cat like how she does to me. I never had much luck telling her something using words besides things like calling her using her name or telling her that “Yes, I know, just a second.” A meow that’s not too short but not too long is kinda like a conversation for when we want to talk about something. Really long low-pitched meows are complaints. Hissing or growling is anger towards something someone did, looking at the person or thing we’re angry at. Purring and nudging each other is seeking affection. A short high pitched meow is to get some breif attention. Medium lengthed and pitched meows are acknowledgements and greetings. Short purry meows are “Come here”. High pitched meows of medium length indicating happiness or sadness depending on the body language and the amount of ‘purr’ we put into the meows. I have a feral cat that I have trained to be an indoor cat. He was feral eight years. I would never raise my voice to him because ferals don’t like noise, it gives away their position. They live as quietly as possible outside. Now if I accidently up my voice he will look afraid so I just don’t do it. He is very well behaved and knows what “Treats” and “No” mean but it’s always said softly. He is the most well behaved cat I have ever had. He never jumps on anything other than his window perches. He never begs for human food. He’s very considerate when I’m not feeling well and watches me like a caregiver. o amor ao bichos de estimação não tem preço tenho na minha casa trés gatos são meus amores ele faz minha vida mas feliz. The word “penultimate” does not mean what you think it means. I am trying to find out what a cat in heat is called and I get everything I already know. Please contact your vet with any medical questions!